The title says it all - Socktopus is the latest beast that all sock knitters will be seeking to capture this winter. With 17 beautiful patterns for both women and men, you won't have any difficulty finding one that gets your sock needles rockin'! 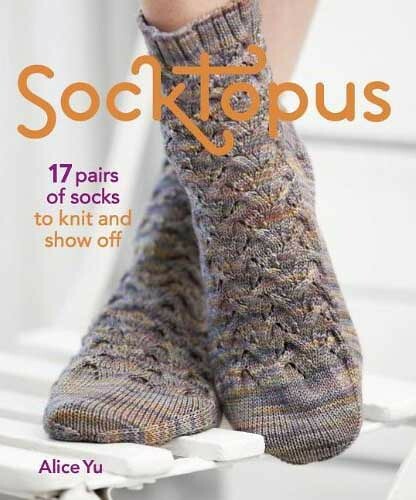 Socktopus is the ideal book for both new and seasoned sock knitters alike. Not only is it full of elegant patterns, it also features clear, helpful instructions on many of the topics that sock knitters stress over, including how to master turning a heel, sizing a sole and fitting a high arch. Author Alice Yu covers each technique of sock making in detail, including toe shaping, heel shaping and perfect fit sizing. She also included a comprehensive section on fiber and yarns that is sure to entice even the most seasoned yarn addicts. Kandahar ~ Alice's description says it all: "these zippy socks have downhill pistes winding their way down the leg, and a central panel of tractor-groomed snow"
Om Shanti ~ the author designed these to be bed socks, knit in a luxurious cashmere blend and I simply say "Om YES!" Still looking for the right gift for the knitter on your holiday shopping list? Pick up a copy of Socktopus and if you're lucky, she'll repay you with a pair of handmade socks next Christmas! About the Author: Alice Yu is a renowned sock designer who writes a popular blog, "Socktopus," which sprang from her Socktopus knitting club and Knit Love yarn shop. She is founder of Knit Nation, the knitting expo that is the UK sister of Knitalong in the US. I simply have t to get back to knitting socks. I have too much sock yarn (and cold feet) to pretend I can do shawls, gloves, etc. and use it all up!